Among others, modern kitchen decors with individual and customized design elements are trendy. State-of-the-art digital printing on various printing materials like glass, acryl glass, anodized aluminium, wood, ceramic is the solution for such customer requirements for interior concepts with personal touch. Not only the modern kitchen, nowadays more living area than working space, profits of the digital printing technology and its design options for an individual branding. 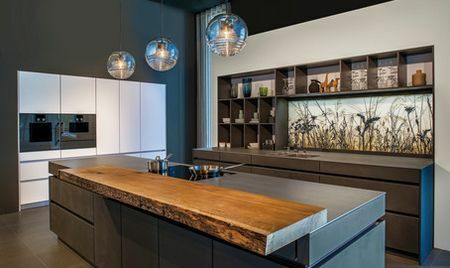 The world largest kitchen fair „Küchenmeile A30“ recently showcased some of Janoschka’s design kitchen panels manufactured in digital printing. The digital printing process at Janoschka is specifically focused on the quality requirements of the decor market and optimized for surface design for interior and exterior use. Digital printing with organic Sol-Gel ink offers various printing applications such as room dividers, shower cabins, kitchen design panels, lighting and heating elements on a wide range of printing materials.